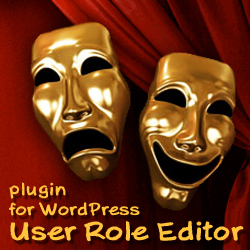 User Role Editor WordPress plugin version 3.8 is published at September 1st, 2012. What’s new? – Bug fix: Some times URE didn’t show real changes it made to the database. The reason was that direct database update did not invalidate data stored at WordPress cache. Special thanks to Knut Sparhell for the help with detecting this critical issue. – WordPress core capabilities are shown separately from capabilities added by plugins and manually. – If you configured URE to show you ‘Administrator’ role, you will see its capabilities, but you can not exclude any capability from it. I may just add capabilities to the Administrator role now. The reason – Administrator role should have all existing capabilities included. – Brasilian Portuguese translation is updated. This entry was posted on Sunday, September 2nd, 2012 at 01:47	and is filed under ShinePHP plugins news, WordPress. You can follow any responses to this entry through the RSS 2.0 feed. You can skip to the end and leave a response. Pinging is currently not allowed.